The future of a potential "comet of the century" is still uncertain, with just under two months to go before the icy wanderer makes its closest approach to the sun. With just two months to go before Comet ISON skims within about three-quarters of a million miles (1 million kilometers) above the sun's surface, it's still uncertain whether the comet will evolve into a stunningly bright object that will put on a memorable show in December, or turn out to be nothing more than a dim fuzz ball. Because the comet's brightening had seemed to stall during the first half of this year, there was hope that once it reappeared, it would look significantly brighter. It was, indeed, brighter, yet not as bright as many had hoped. In fact, the comet was running about two magnitudes — or six times fainter — than forecasts had originally suggested. This new information has spawned two camps anticipating ISON's future performance: those who think ISON will be a major disappointment and those who are still holding on to the hope that ISON will become a bright naked-eye spectacle. Astronomer Bruce Gary was the first to photograph ISON after it emerged from the glare of the rising sun on Aug. 12, and belongs to the first camp. According to Gary's calculations, the comet might not get much brighter than fifth or sixth magnitude, which is near the threshold of naked-eye visibility. "I've begun to lose interest in this comet, which may never become visible to the unaided eye," Gary said. "I wonder why someone ever suggested that it could become the 'comet of the century.'" On the other hand, astronomer Karl Battams of the Naval Research Lab in Washington, D.C. has issued a more sanguine outlook. "Certainly, we would love it to be a couple of magnitudes brighter right now, but it's doing just fine," Battams said. "I'd say it's still on course to become a very eye-catching object." Earlier in September, based on a consensus of visual observations made by reputable observers, Comet ISON appeared as bright as 13th magnitude — still more than 600 times fainter than the dimmest star that can be perceived with the naked eye. Over the last few weeks, the comet has nearly doubled in brightness to about magnitude 12. Denis Buczynski, secretary of the British Astronomical Association's comet section, photographed ISON in a somewhat hazy sky on the morning of Sept. 26. "ISON seems to show some evidence of gas tail/streamers in my images north of the head," Buczynski wrote in a description. "The comet is beginning to look quite active now." More time and more observations will be needed to get a better handle on exactly how bright Comet ISON will get. Some of those observations will truly be out of this world: Scientists will observe the comet from Earth, and rovers on Mars and spacecraft orbiting the Red Planet will have a great view of the celestial showcase. On Tuesday, the comet will pass just 6.5 million miles (10.5 million km) above the Martian surface. Researchers aren't sure whether Mars rover Curiosity will be able to capture images of the comet from the surface of Mars — that will depend on how bright ISON is as it makes its closest pass to the Red Planet. According to astronomer Carey Lisse of the Johns Hopkins University Applied Physics Lab in Maryland, the best bet for observation will be NASA's Mars Reconnaissance Orbiter (MRO). The MRO satellite is equipped with a powerful half-meter (1.5 feet) telescope named HiRISE that is capable of detecting ISON's fuzzy coma and tail. HiRISE will be turned toward the comet on Oct 1 and 2. In addition, an unprecedented 16 other NASA spacecraft observe the comet as it heads sunward. The astronauts on board the International Space Station will be watching, too. Buczynski's observations may also suggest that ISON is in the process of crossing the so-called "frost line," where heat from the sun starts to vaporize the frozen water of the comet. Up to 90 percent of the volatile material in a typical comet are water ice. Carbon dioxide and other gases are likely behind the relatively little brightening of Comet ISON. But if ISON crosses the frost line in the coming days, "the whole comet could erupt in geysers of gas," Lisse said. The moment of truth will come on the U.S.' Thanksgiving Day (Nov. 28), when the comet will graze the sun's surface. Don't forget: ISON is, after all, a chunk of material that has spent thousands of years in the depths of deep space, where temperatures barely hover above absolute zero (minus 459.7 degrees Fahrenheit or minus 273.2 degrees Celsius). For eons, the comet has been "soaking up the cold," so to speak. But on Nov. 28, ISON will be moving through the sun's outer atmosphere, where it will be subjected to temperatures in excess of 1 million degrees F (555,538 degrees C). This extreme heat could cause the comet's 3-mile-wide (4.8 km) nucleus to break apart into several pieces — much like what could happen when you pour hot tea into a cold cup. All hope for the comet is not lost, however. The fracturing process could release a fresh stream of dust into space that could translate into a spectacularly long and bright tail in early December. It could also cause the comet's brightness to suddenly spike. But it is still possible that the comet could disintegrate. 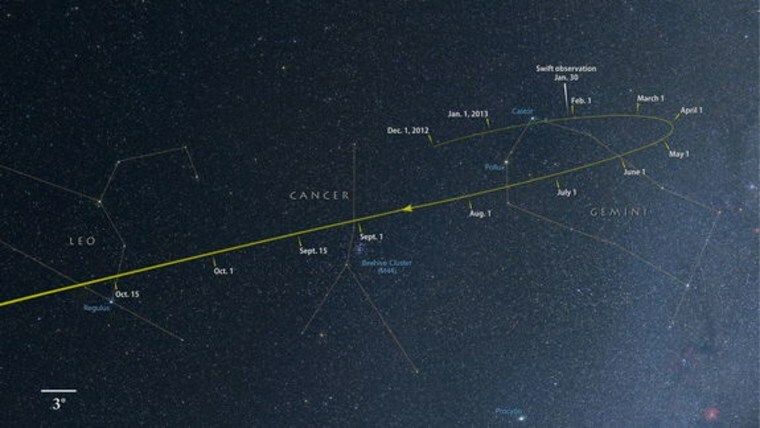 Comet Lovejoy did just that in December 2011, but only after it passed the sun. Lovejoy eventually evolved into a celestial showpiece, and disappeared a few weeks later. ISON could also disintegrate before it reaches the sun, but at least one expert does not think that will happen. Astronomer John Bortle, a highly reputable comet observer, thinks "ISON appears likely to survive the in-bound leg of its journey all the way to the sun." "It will probably brighten more slowly than all the early hype led the public to believe," Bortle said. "Nevertheless, Comet ISON should very briefly become exceptionally bright, at least rivaling the planet Venus in the hours preceding its closest approach to the sun." In the coming days and weeks, we'll likely have a better idea of what Comet ISON. Stay tuned to Space.com for future updates.